Equisales is a full-service engineering, procurement and construction (EPC) provider. Our fast-track capabilities include high-voltage substation construction as well as transformer assembly, installation, maintenance and repairs. Next-generation capabilities support a healthy grid, wider power distribution and increased productivity. Our electrical engineers, installation experts and field technicians are available to assist with all aspects of substation construction, including planning, late-stage intervention and post-installation testing. Through strategic purchase agreements with worldwide partners, we can procure high-voltage transformers, circuit breakers and switches that are essential for the rapid construction of distribution and transmission substations. We supply generator step-up transformers that increase voltages for long-distance three-phase transmission as well as step-down transformers that decrease voltage for local distribution to down-steam consumers. Specialized equipment is also available for the construction of industrial substations. We engineer a variety of high-voltage, fast-track solutions for clients in the gas and oil industry and other high-use sectors. Comprehensive in-house capabilities offer value and efficiency to our high-voltage clients. By combining equipment procurement and time-critical services, we can complete turn-key facilities in eight to 12 weeks. Fast-track solutions also save money during repairs and routine service. If a critical component fails during commissioning or operation, we can supply and install a replacement in a matter of days. 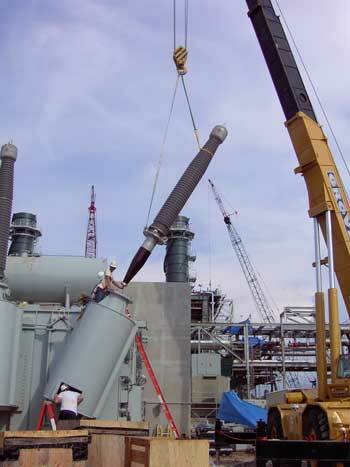 Our efficient transformer construction and assembly services control costs and prevent delays. Transformer repair and custom manufacturing options give clients the opportunity to select a solution that best fits their requirements. If a component fails, we can provide a compatible rental. The benefits are significant because clients can resume operations without investing in new equipment. Our goal is to strengthen the grid and transport power from new generating plants to end-user destinations while meeting cost and time objectives. We have an excellent track record for assembling single-phase and three-phase equipment and constructing all types of high-voltage facilities. We provide EPC services for substations, dead-end structures and switchyards. Time and cost advantages are a central part of our fast-track service. Short-term projects costs less and offer increased profit potential. Substation construction and assembly starts with plans supplied by the client or our in-house engineers. The equipment is sourced from our inventory or global supply network. Complete configurations are shipped to the site along with installation experts and mobile field units. With 100 years of cumulative experience in the power industry, our high-voltage solutions are customized to the requirements of each client as well as the scope of the project and the dynamics of the region. Equisales offers comprehensive services and special assistance during planning, construction, testing and maintenance. To request a quote or to schedule immediate on-site service, call 713-733-3999. We are available day and night.